The Customer Portal is a place for your customers to view all sorts of information about their tickets, communicate back and forth with you to paying you! It's not an actual portal created from folded space-time. Well, maybe in a different universe it is anyway. Know what you are looking for? Is it one of these? Quickly jump to them! First where is the Customer Portal? Head to the Customer Detail Page and on the left side there is a section called "Customer Information." At the bottom of the section, there is a link called Customer Online Profile (Customer Portal) that can is available as long as there is a email for the customer entered in their info. This will be where you can access the Customer's Portal to see what they can see. The idea of the Customer Portal is to bring another level of communication to your customers to stay informed about their repairs or work being conducted by your shop. The Customer Portal is automatically created for every customer in the system that has a email address entered. 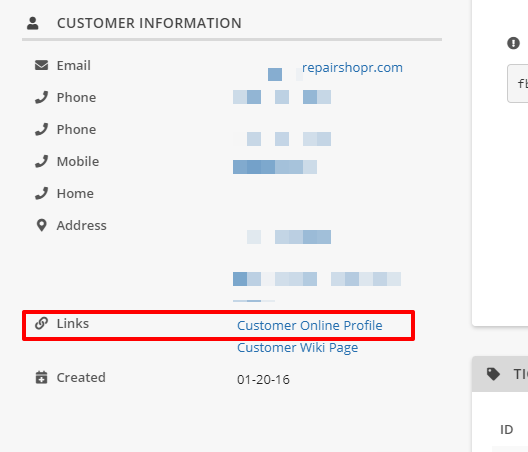 We include a link to the Customer Portal in the footer of emails that go out to customers be default. Of course that can be changed in the PDF/Email Template section of Admin. Let's start with what it looks like first! Let's go through the sections that are on here to explore what can be done on the Portal starting the top. Clicking the Ticket number will take the customer to the Ticket Detail where you have the below functions. The customer can send you messages and they will be applied directly to the ticket. There are even notifications you can set in the Notification Center to be alerted when this happens! If you are using one of our Integrated Payment Gateways or PayPal, customers are able to pay their invoices in the Customer Portal. They can choose to pay individually or multiple invoices at once. Clicking the Invoice number on the right will take them to the detail screen for the invoice. On the Invoice Detail screen, the customer can view the invoice as a PDF or download it locally to their computer. If connected to a Payment Gateway there will be button to process their payments. While by default it is possible to get directly in to the Customer Portal, we do have a feature that allows you to provide the customer a Username and password to secure their Portal. If the customer has employees that may need to use the portal or that may submit work requests, we recommend also turning on Contacts in the Customer Preferences. We will populate the "Customer/Contact" section with the primary customer. This field is a drop down that allows you to select from the Customer Contacts as well. The Login Field will pre-populate with a random assigned login id. This is the username for signing in to the Portal. We recommend changing this to the customer/contact's email address. It is also worth noting that we have a function to automatically send Portal User invites when the customer and contact are created in RepairShopr. You can activate that in the Customer Preferences > Advanced > Always Send Portal Invites to New Customers > Save. The Password field will always default to empty when manually creating contacts. You can create a pasword for the Portal User or send them a email invitation for them to create their own (recommended). It is also possible to Redirect the Customer Portal if you do not want customers using the Portal to a URL of your choosing. A good example might be you could direct your customers to a Custom Widget or maybe a page on your business website. To do this, head to Admin > Customer Preferences > Advanced > Disable Customer Portal and redirect to URL (Leave blank to allow access) > Save. When you create an additional user they will not see the same screen of the original customer. In order to give them access to all of the info from the account, they will need admin access. You can give them access by following the steps below. In the drop down select the new contact's name put in the users email, and create a password. Once that is complete, select the drop down for the user’s name in the Portal Users section and select the name of the main user. This will give the new contact access to the Admin portion of the portal.